The common sassafras tree (Sassafras albidum) is a member of the laurel family. 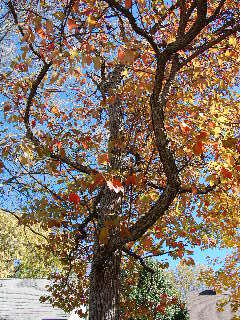 The sassafras usually occurs as a free-standing tree that grows from 20 to 30 feet in height (sometimes up to 50 feet or more). Or it can also often be found in clusters of shrub-like plants growing 12 to 15 feet in height. 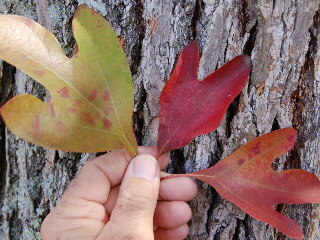 A deciduous hardwood tree, the sassafras has uniquely shaped leaves that are dark green in the summer months--changing to brightly colored shades of yellow and red before abandoning the tree in late fall. Some of the leaves are entirely elliptical with smooth edges and no lobes at all. Others exist in symmetrical three-lobed shapes. And a third shape is that of one large lobe accompanied by a smaller single side lobe (sort of like the shape of a child’s mitten). Sassafras occurs naturally over most of the eastern United States--from Florida all the way up into the New England and Great Lakes areas, and extending farther northward into Canada. New trees are often started from seeds that are dropped by birds that have eaten the fruit of the sassafras trees. Sassafras is undemanding of soil types and will thrive on poor soils, the main requirements for sustained growth being adequate moisture and sunlight. The bark of the young sassafras tree is smooth and brown. As the tree ages into a larger more mature specimen, the bark becomes a darker shade of brown and the surface becomes deeply and roughly furrowed. Oil of sassafras, which is used in perfumes and soaps (and to a lesser extent in medicinal applications), is derived from the roots of the sassafras plant. Sassafras tea was believed to have been utilized by the early Native American peoples as a tonic and as a digestive aid. If you happen upon a sassafras tree during one of your excursions in the woods, you can generally identify it by the characteristically shaped leaves. Another clue to its identity is revealed by twisting the stem of one of those leaves, which will release the sweetly pungent aroma of the sassafras oils--a unique and pleasant odor somewhere between citrus and spearmint.